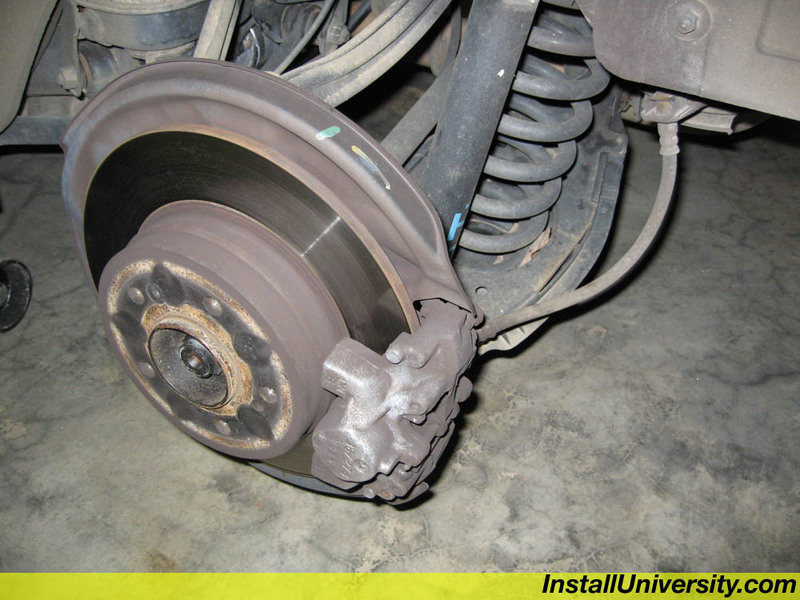 Symptom(s): The rear brake pads are wore to nothing and they need to be changed. 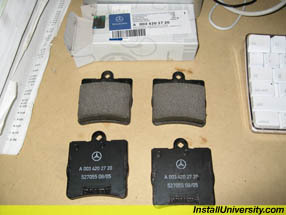 This is an easy service to perform and will cost you much less than MB performing the installation. Just be careful and take your time. 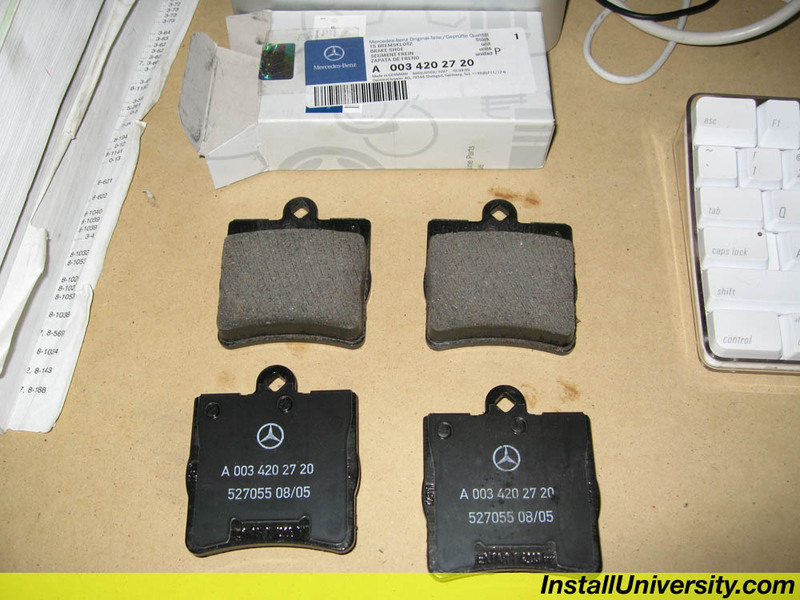 After all, this is your brakes and not a rear spoiler so be sure you are careful. 1. 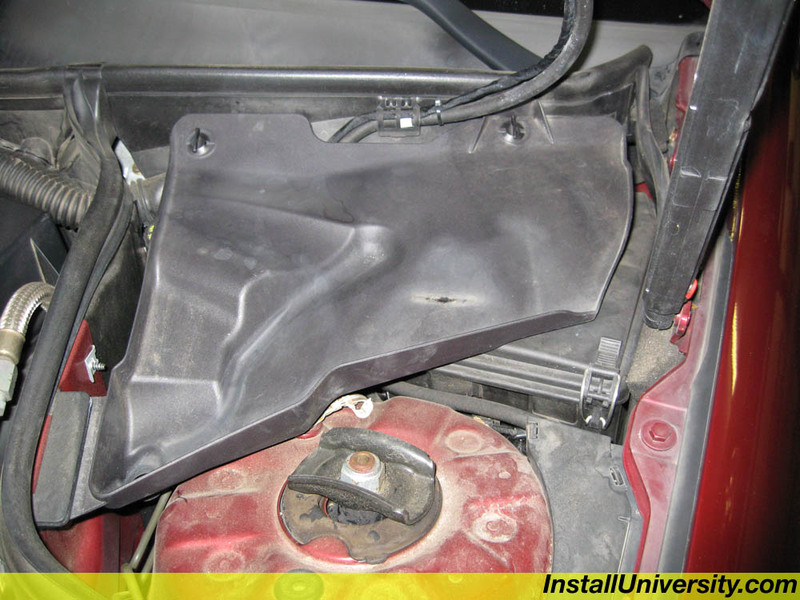 Raise your hood, and locate the black triangular cover nearest the driver side side mirror (Figure 1). 2. 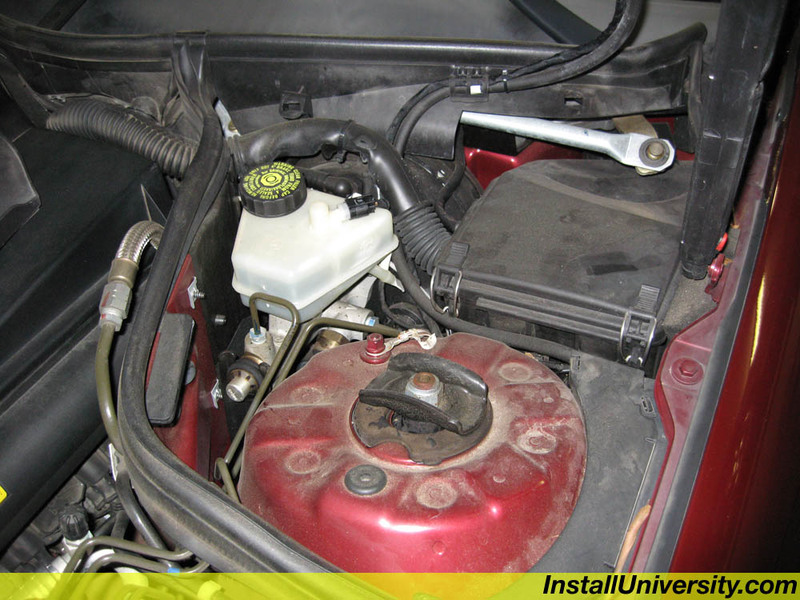 Remove the cover by turning the two locks 90 degrees exposing the brake fluid resovoir. Loosen the brake fluid reservoir cap but do not remove (Figure 2). 3. Jack the car up and support the car on a jack stand or other safe device. Remove the rear tire using a 17 mm socket. 5. You will need be ready to catch the brake caliper before it falls after you remove the second bolt. 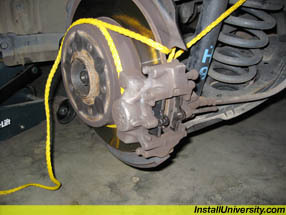 Be sure not to let it fall so you don't damage your brake line. Use a rope or small bun-gee cord to act as a security blanket in case your arms get tired. 6. You need to remove the pin (Figure 4) by using a hammer and punch. We used a small hex wrench since it needs to be long and skinny. It will be difficult and awkward. Pressing down on top of the spring will help get the pin out with ease once you get the pin partially out. Have patience. 7. 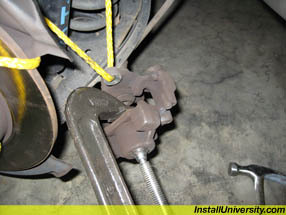 Once the pin is removed you will need to use the C-Clamp and one of the old brake pads to push the caliper pistons back into the frame (Figure 5). Take your time on this step and slowly compress each piston (one on each side). 8. Take the new pads out of the box (Figure 6) and insert them into the caliper and place them back on the caliper frame (Figure 7). 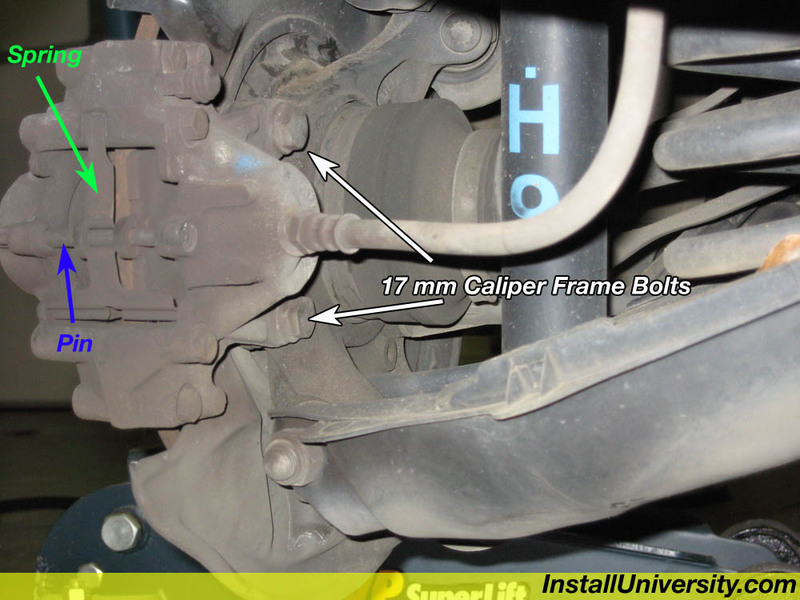 You can put the two 17 mm caliper frame bolts back in hand tight at this point to help hold the frame. I did not install the bolts at this point since I had my caliper frame tied tight. 9. You will need to insert the spring back onto the caliper frame and then insert the pin (Figure 7). It is much easier this time but will require you to easily hammer the pin back in. 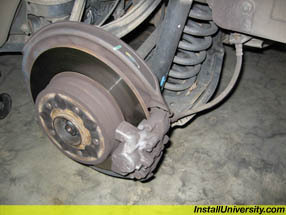 Press on the spring and the pin should easily slide through the inside brake pad, over the spring, the outside brake pad, and finally through the other side of the caliper frame. 10. 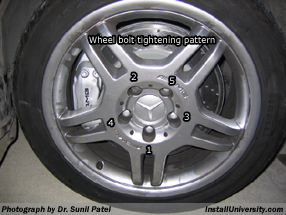 Place loc-tite on the two 17 mm caliper frame bolts and tighten to 115 Newton-meters (Figure 8). 11. Double check that the pin is installed properly and the bolts are tight. 12. Reinstall the wheel and tighten the 17 mm wheel bolts to 100 ft-lb using the star pattern to tighten each wheel bolt (Figure 9). 13. 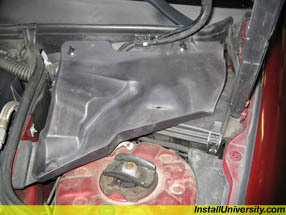 Lower the car and your done!